Most real estate listings rely heavily on one or two main highlights: a great location, updated renovations or proximity to schools. 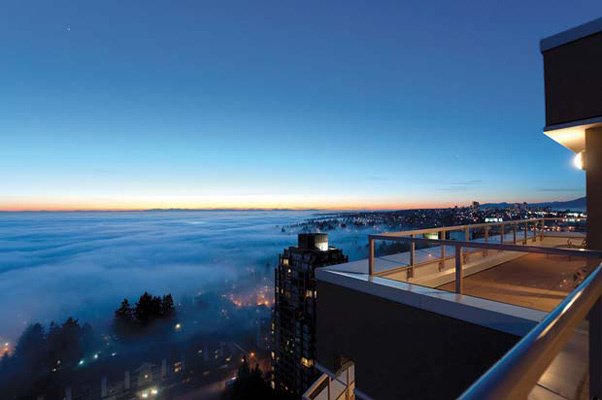 In the case of a newly listed penthouse condo in the heart of Burnaby, there are simply too many highlights to name just a few - and that's reflected in its record-breaking listing price and its description as "the most luxurious, spacious and expensive penthouse ever offered in Burnaby." The penthouse at the Savoy Carleton, south of Kingsway near Edmonds SkyTrain station, was listed just a few days ago for $2 million. "I looked back on the public MLS system, and the closest (condo listing) I could find was $1.3 million," said real estate agent Ian Watt. But, he says, it's certainly worth every penny. "The size, for one thing, is phenomenal," he said. The unit - which has views extending from Mount Baker to the Gulf Islands - has 2,877 square feet inside over two floors, with another 1,100 over two patios (not to mention the four parking spaces and additional ground-floor storage), which gives it far more space than most single-family homes, notes Watt. "It's really a one-of-a-kind property," he said. That's not just lip service: the penthouse was originally built as two separate but adjacent units in 1992 but four years ago was overhauled and renovated to become one larger two-floor home. "They combined the two (penthouses) into one - it was a major job, but it turned out beautifully," he said. The unit has three bedrooms and four bathrooms, including a massive master suite with a gas fireplace, marble and granite bathroom ensuite with a Jacuzzi tub, and a private deck. There's also a sauna, a built-in sound system throughout the house and custom lighting. The 200-square-foot kitchen has custom cherry wood cabinets and millwork, high-end Sub Zero and Dacor appliances and built-in wine fridge. Watt typically only works with Vancouver properties but says his reputation for working with high-end penthouses - and his previous experience working with the owners - led him to represent this property. And after just a few days, he's already had a few bites. "We just showed it - people from this area looking to downsize from a bigger house," he said. He's confident the price is a reasonable one given its size, location and amenities and comparable properties - he recently sold the neighbouring unit, at half the size, for about $800,000. "It's a different world - it's beautiful up there. We were up there last week when we had all that fog rolling in, and it was amazing - like being in an airplane above the clouds," he said. "You can look in one direction all the way to Mount Baker and in the other direction to the Gulf Islands, parts of downtown. It's stunning."